We had a kind of “false spring” last week here in Southern California. The sun came out for a few days, and we soaked it in like sponges. All kinds of spring plants began to bloom, causing a surge in pollen (and making me sneeze nonstop). I didn’t care too much, I was happy that the warm weather had finally arrived. I thought it would stay. Alas, like a cruel temptress, spring has disappeared, leaving us with at least another week of winter and another storm on the way. I’m thankful for the rain, our farmers need it. But I sure do miss the sun. 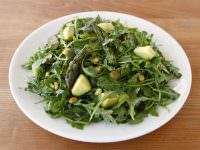 Inspired by our brief encounter with spring, I developed this Roasted Asparagus, Avocado and Arugula Salad. It’s like spring on a plate. I considered calling it a “Triple A” salad– Asparagus, Avocado, and Arugula– but settled on naming it descriptively rather than artistically. Full disclosure here: I’ve never been a big fan of arugula. The flavor is too peppery for me. I much prefer spring greens. But the arugula at the farmer’s market looked so fresh, so crisp, that I couldn’t resist. Many people love this delicate green, and it looks so pretty and spring-like on the plate. I decided to challenge myself to find a way to make that peppery flavor work in a salad. To start, I added some of my favorite ingredients– oven roasted asparagus, toasted pine nuts, and who can go wrong with ripe avocado? Then I dressed it all with a slightly sweet citrus-basil dressing. The light, simple dressing magically mellows the peppery flavor of the arugula, bringing together the other ingredients in perfect harmony. This recipe is kosher for Passover, my favorite springtime celebration. It would make an elegant appetizer or side salad for your Seder menu. I gave some make-ahead tips in the recipe below. Make sure you use larger stalks of asparagus for this salad, they will roast up beautifully sweet and tender. Don’t skip the roasting, it adds another dimension of flavor and it’s most definitely worth the extra effort. I ate three servings of this salad as I watched the clouds roll in. Yes, winter is back for a few more days, but spring is alive and well in my kitchen. Elegant spring salad recipe. Roasted asparagus, toasted pine nuts, avocado, arugula & sweet citrus dressing. Easy vegan sub, kosher for Passover. Preheat oven to 450 degrees F. After you clean your asparagus, make sure to pat it totally dry before proceeding. Slice the tough stalk ends from your asparagus (1-2 inches at the bottom of each stalk). 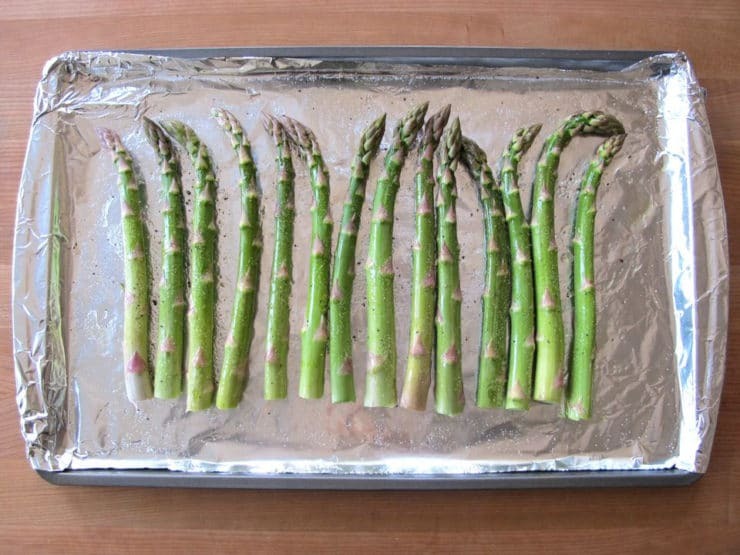 Place the asparagus on a baking sheet; I foil line my sheet for easier cleanup. 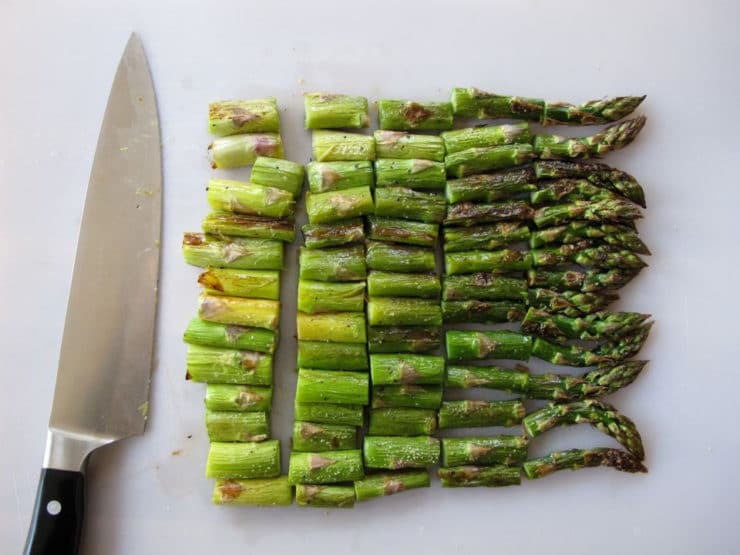 Drizzle the stalks with 1 tbsp olive oil, then rub each stalk with your hands to evenly coat with oil. 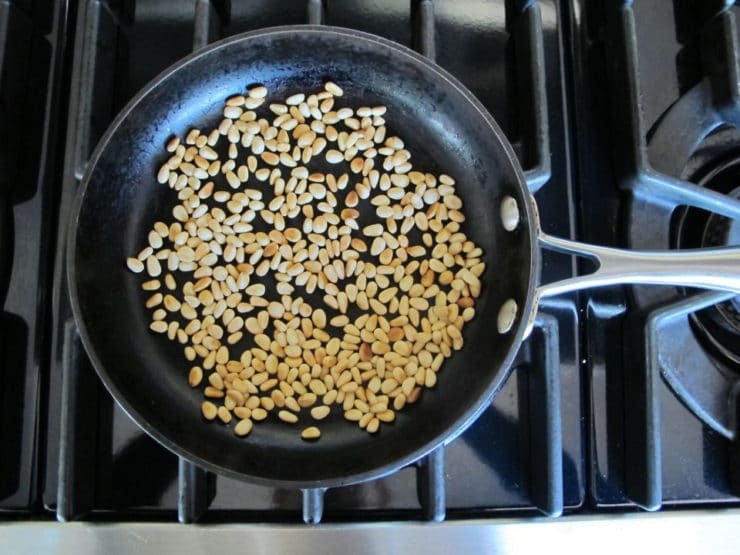 Sprinkle with salt and pepper—freshly ground black pepper is best. 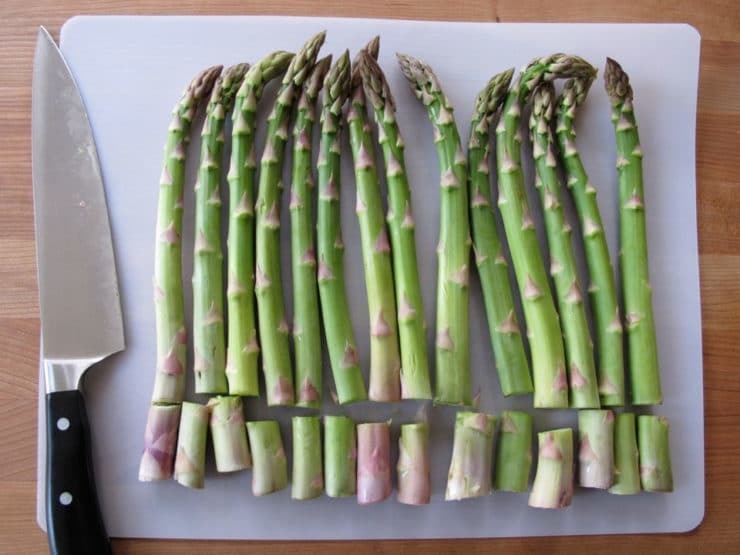 Place prepared asparagus into the oven and let it roast for 12-15 minutes till the toughest parts of the stalks are tender and the leafy tips are starting to get crispy. When the asparagus has finished cooking, remove from the oven and allow to cool to room temperature. Cut each stalk into 4-5 pieces each. Discard any overly tough ends that did not get tender during roasting. 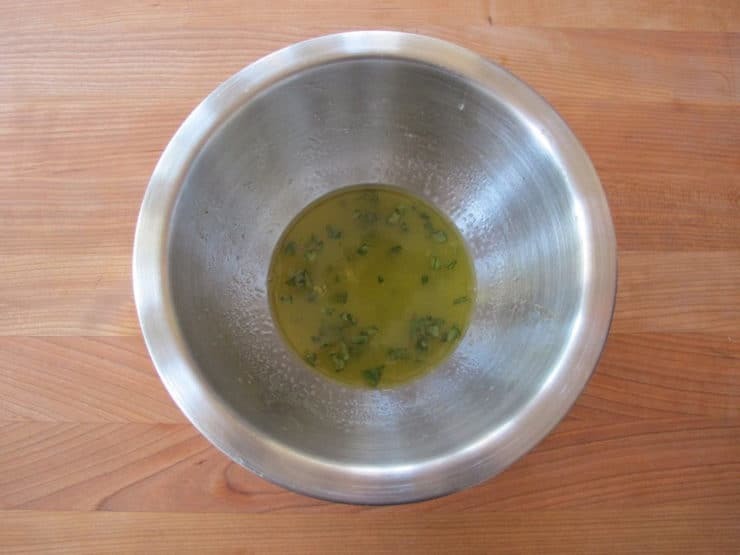 In a small bowl, whisk together orange juice, 1 tbsp lemon juice, basil, honey and a pinch of salt. Vegans can sub agave for the honey in the dressing, or leave it out. As you whisk the mixture rapidly, very slowly drizzle in the remaining 2 tbsp olive oil till emulsified with the juice mixture. Reserve dressing. Cut the avocado into small cubes. Sprinkle with the remaining ½ tbsp lemon juice to keep it from turning brown. 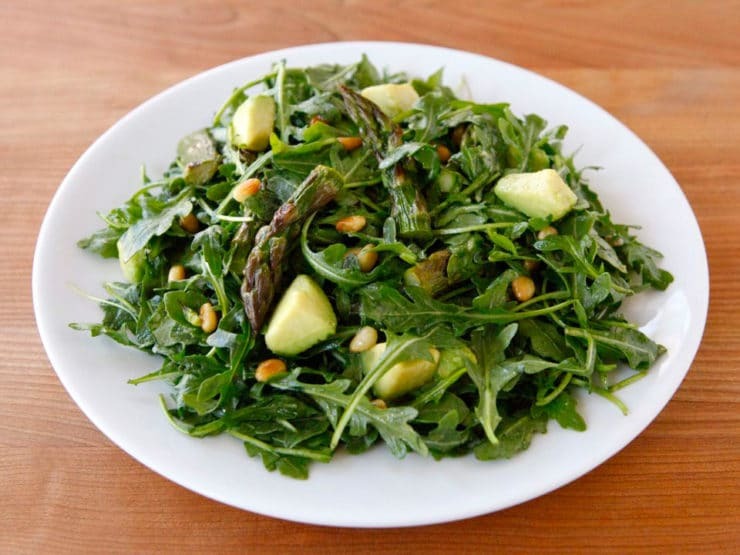 In a large salad bowl, combine the arugula, roasted asparagus, toasted pine nuts, avocado and dressing. 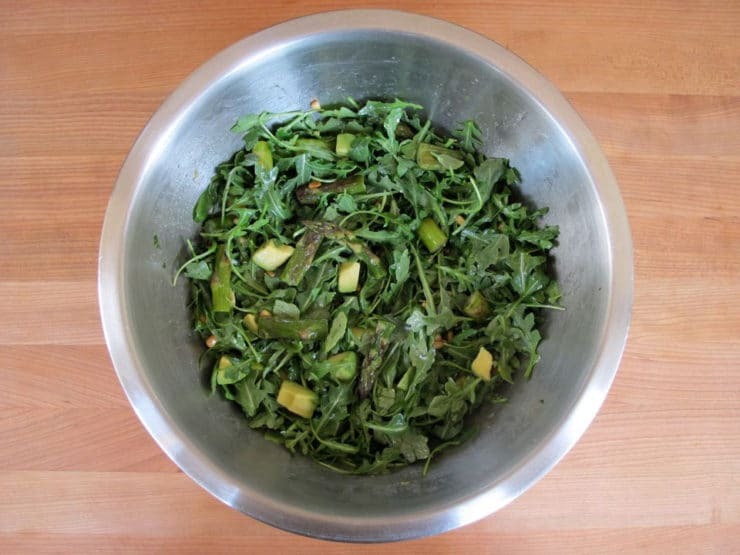 Toss gently till the ingredients are well mixed and the arugula is evenly moistened by the dressing. Season the salad with additional salt to taste, if desired. Serve. This salad is easily doubled for a crowd, and can be partially made ahead for easier serving. Roast the asparagus and toast the pine nuts in advance, and juice the citrus for the dressing, then store in airtight containers till ready to serve (refrigerate the asparagus and juices for up to 24 hours before serving). Just before serving, slice the avocado, whisk the dressing and toss the salad. It tastes best at room temperature, so if you’re making some elements ahead, be sure to take them out of the refrigerator and let them return to room temp before tossing the salad. Im making this salad for Passover, and had a question about the amount of lemon juice. The ingredient list calls for 1 1/2 tsp divided and the instructions (no. 5) call for 1 Tbsp. Hi Debbie, it’s 1 1/2 tablespoons total in the recipe, divided. My recipe software was recently updated and I had an assistant pulling over the recipes one by one, she must have accidentally written teaspoon instead of tablespoon in the ingredient list. Sorry about that! Fixing now. SO GOOD! I made it last night and want to make it again tonight. I’m looking for an appetizer to bring to a friend’s home…I found your website…now I want to make “everything”….everything looks so delicious…I was looking for a Babka recipe and here I am! Actually Jenny, cilantro is the leaves of the herb and coriander is the seeds. I don’t think that they are very interchangeable, for the most part anyway. This dressing is perfect with Arugula. It was a big hit. Thank you so much! Glad you enjoyed it Nancy! I tried out your recipe, but used toasted cashews instead of pine nuts. It worked well as a substitute. Great salad, everyone loved it! Thank you! Fantastic idea thanks. Made it yesterday for my kids and it went down a treat. Only addition I made was some lightly roasted pumpkin seeds sprinkled over the top. My family love these and they’re so good for them. This looks wonderful -can’t wait to try it but I have a tree nut allergy and as a rule, avoid pinenuts…is there anything you can recommend to substitute? I get tired of just leaving an element out, especially when the crunch factor is such an integral part of the recipe. Thanks for the great salad! I made this for dinner the other night, and was absolutely gutted to find that asparagus was out of season, so we substituted it for some blanched green beans, and added in some haloumi, and it was absolutely delicious! I can wait to actually try this with asparagus. Great recipe! Hi Brittany, sorry to hear that! Where do you live? Here in California asparagus season is in full swing. The green beans are a great substitution idea, and I adore halloumi. I am SO looking forward to making this, especially fresh ingredients from the farmers market soon! Your description for each recipe is clear and with pictures to tempt us is wonderful! Glad I found you! Wow this looks outstanding!!! Totally craving it! I have NEVER heard rocket called “arugula” before…thank goodness for Wikipedia! I wish the USA and the rest of the world could just agree on the same names for things. I had the same confusion when people kept talking to me about garbanzo beans and cilantro, meanwhile I had no idea they meant chickpeas and coriander! Ahhh, globalism. What a beautiful salad! The arrival of spring always gets me excited for asparagus and fresh greens.